In the last hour Erdogan’s air force attacked and bombarded Afrin. Hevals noted over 72 planes flying over Afrin and bombing indiscriminately. Hevals also confirm that direct conflict with Turkish backed terrorist groups have occurred. Two tanks have been captured by the SDF/YPG/YPJ and many killed and captured from the terrorist groups; but there are a number of injured and martyred on our side too. For well over two years Erdogan’s planes have bombarded Afrin provinces, dozens of villages have been destroyed with even more innocent civilian massacred. For weeks now Erdogan has threatened to attack Afrin, and it has finally taken the step to wage a direct war with the SDF/YPG/YPJ forces. Reports confirm that Russian forces have withdrawn from Afrin in a move to allow Turkey to directly free reign. Reports also confirm that Turkey has bused in thousands of terrorist groups to surrender Afrin and impose a complete blockade. It is crucial to remember that Turkey has attacked the center of the city- a direct attack against innocent civilians. An unknown number at this stage have been injured and killed. In Kobane morale is high. 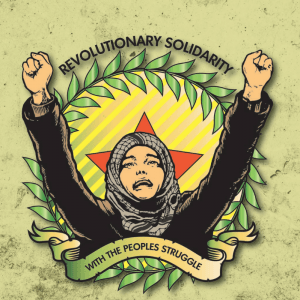 We are cheering on our heroes with great confidence; and we believe that against all odds, against NATO’s second largest military, against the planes bombarding, against all reason and all logic that the heart of Rojava- its democratic and gender empowering soul- will succeed; as we did just three years ago with Kobane. For Kurds this is a particularly painful and traumatic time as we face another ‘Kobane’. But this is not a time to panic. This is not a time to be overwhelmed with the gravity of yet another unwanted war at our doorsteps. This is a time to remember the immensity and the ground breaking courage that shook the world with the force of 10 Richter magnitude scale just three years ago. It is time to remember that our young women withstood the barrage of onslaught of thousands of ISIS fighters armed with the best looted and supplied heavy weaponry- as they liberated thousands of Yezidi women and girls enslaved and smashed patriarchy. It is time to remember the Arin’s and Dastina’s and Zilan’s. It is time to remember that there are families here in Kobane alone that have over 17 martyrs- reinforcing the idea that we will do anything, at any cost to defend Kurdistan, defend freedom, defend democracy and all that is sacred in a world torn apart by fascism, capitalism, terrorism. It is time for courage, self belief, unity and strength. It is a time of an unshakable belief in the success of the Revolution of Rojava and the young women and men who stand between us and the tanks and the planes of the petrified enemy. But this is also a time for action. Share the voices coming out of Afrin and Rojava. Speak, share, post, write. Write to your MPs and senators and demand an immediate response to Erdogan’s terrorism. Write to your local papers and demand more attention on the plight of the Kurds and other innocent civilians and ethnoreligious groups living in Afrin. Flood social media and make them listen to the voices and the people who stood up against ISIS and humanity and freedom when no one else had the courage or the will.